JACKSON, Miss. (AP) — President Donald Trump is defending a Republican U.S. senator from Mississippi who praised one of her own supporters by saying she would attend a “public hanging” if the supporter invited her — a remark that has stirred strong emotions in a state with a history of racially motivated lynchings. Trump said at the White House on Tuesday that Sen. Cindy Hyde-Smith is “a tremendous woman” who loves the people of Mississippi and the U.S.
A video published Nov. 11 shows Hyde-Smith praising a supporter at a Nov. 2 campaign event in Tupelo by saying: “If he invited me to a public hanging, I’d be on the front row.” She said in a statement that the expression was an “exaggerated expression of regard” and said it is “ridiculous” to read any negative connotation into it, but she has refused to answer questions about it. Hyde-Smith’s campaign did not respond to questions from The Associated Press about whether it would refund Walmart’s contribution. Campaign spokeswoman Melissa Scallan said the senator was focusing on debate preparation. The campaign also did not immediately respond to questions about a 2014 post on Hyde-Smith’s personal Facebook page about her visit to Beauvoir in Biloxi, Mississippi, the last home of Confederate president Jefferson Davis. Hyde-Smith was the elected state agriculture commissioner at the time. The post was labeled “Mississippi history at its best” and had four photos, including one of Hyde-Smith holding a rifle and wearing a Confederate military cap. Walmart spokeswoman LeMia Jenkins said Tuesday that the company donated to Hyde-Smith Nov. 8. That was two days after Hyde-Smith and Espy advanced from a field of four candidates to go to a Nov. 27 special election runoff, but three days before release of the video with the “public hanging” remark. 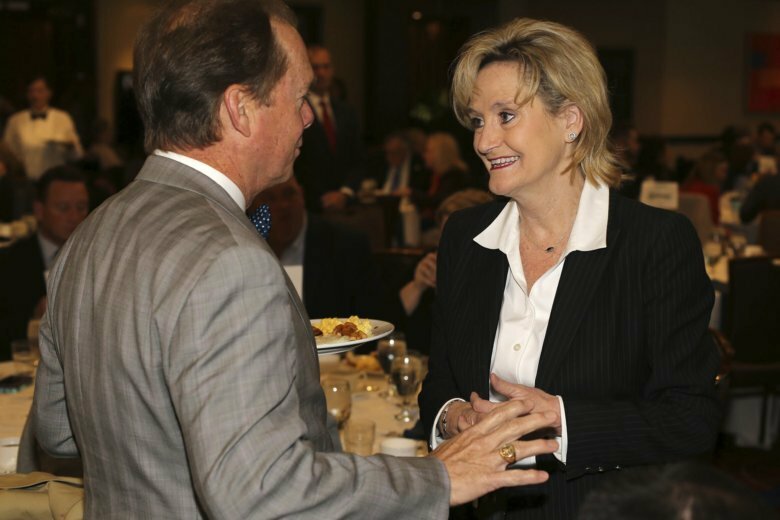 Senate races rarely gain national attention in Mississippi, a deeply conservative state. But this matchup — the last major race of 2018 midterms — has drawn scrutiny after Hyde-Smith’s remarks. Hours before the debate, Hyde-Smith and Espy went separately to the debate site in Jackson to check the television lighting. Hyde-Smith and Espy each received about 41 percent of the vote when four candidates were on the ballot Nov. 6. If she wins the Nov. 27 runoff, Hyde-Smith would give Republicans a 53-47 majority in the U.S. Senate. The contest has intensified since the publisher of a liberal-leaning news site posted a video clip Nov. 11 on social media, showing Hyde-Smith’s “public hanging” comment. The same Louisiana-based publisher, Lamar White Jr. of The Bayou Brief, posted another video clip Nov. 15, showing Hyde-Smith at a Nov. 3 event in Starkville talking about “liberal folks” and making it “just a little more difficult” for them to vote. Her campaign has said she was joking about hurdles to voting. Mississippi has a history of lynchings and violent suppression of black voting rights, and critics denounced her remarks as ignorant at best and racist at worst. Merle Flowers, a white former colleague of Hyde-Smith’s in the Mississippi Senate, said she is being unfairly criticized for the “public hanging” comment. “She’s a fine Christian woman and she meant no ill will in what she said. I believe the national media has blown it out of proportion,” said Flowers, a Republican who is treasurer of Mississippi Victory Fund, a super PAC that has spent nearly $790,000 to help Hyde-Smith in the special election.